It's time to start building your teams and perfecting your skills for the 2017 285 Winterfest! Held at the Meyer Ranch Open Space sledding hill, awards will be given for the Mt Lugo Luge for Fastest, Best Costume and Best Aerial Dismount. 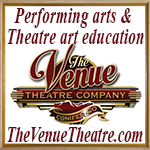 Additional awards for most creatively carved snowman in our 2nd annual Snowman Carving Competition will be given during the second half of our fun-filled day over at Aspen Park Village Center (where you'll find Stagedoor Theatre, Mountain Books, Luna's Mandala and many more wonderful local businesses). We had so much fun last year with this fun family friendly event we're making it an annual tradition. More information coming soon. 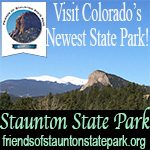 We'd like to also thank Nancy Staub - State Farm Agent for once again sponsoring our annual Mt. Lugo Luge. We certainly could not host this event with their support. 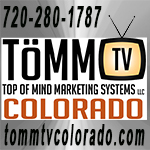 Please help us thank them by supporting local business! Our annual Craft Brew Crawl sponsored by Marketing Type Guys Type Guys​ also returns! What is a craft brew crawl? Join your favorite local craft breweries for a unique beer tasting hosted inside participating businesses in the Aspen Park Village on Saturday, February 25th from noon to 4p. Beer tasting is $15 and includes a souvenir glass. Vote on your favorite for Conifer's Favorite Craft Beer. Enjoy food, live music, snowman carving games and more! PARKING: Park at Aspen Park Village and take the Kid Central shuttle over to Meyer Ranch Open Space. There will be two shuttles available so we can get you where you need to go. When you are done racing, hop on the shuttle back to Aspen Park Village for even more activities. Mt. LUGO LUGE: Family and youth competition will go from 10:00am-11:00am and the adult competition will go from 11:00am-12:00pm. You have three ways to register. 1. Sign up online on our event page to reserve your spot and pay day of event. 2. Day of event stop by the Chamber tent at Aspen Park Village at 9:30am for the family and youth competition or by 10:30am for the Adult competition. 3. Day of event register on the hill at the check in table. MT. LUGO LUGE is sponsored by StateFarm - Nancy Staub. 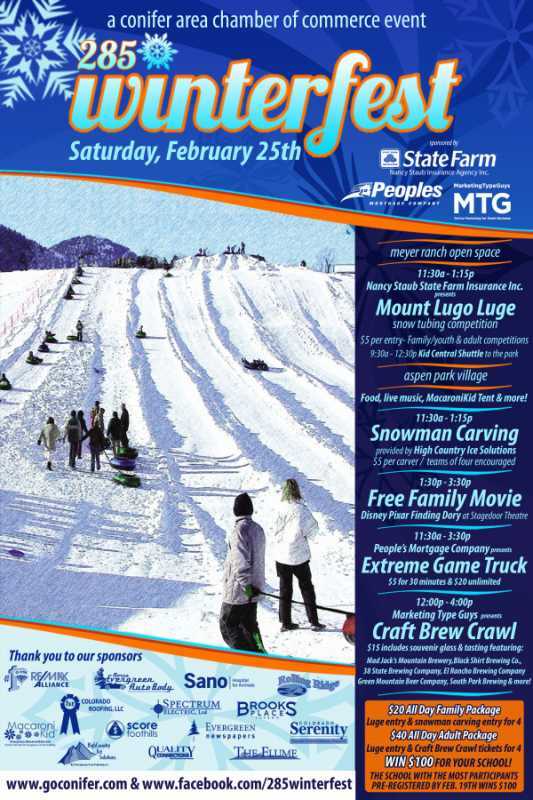 MOUNT LUGO LUGE SCHOOL COMPETITION: WIN $100 for your school! Register by Feb. 19th and fill out any local schools your team members attend. The local school with the most participants wins $100 for their school. CRAFT BREW CRAWL: Check in at the Chamber tent to pick up your tasting glass and then enjoy exploring the businesses at Aspen Park Village while tasting local craft beer. Tickets are $15. The CRAFT BREW CRAWL is sponsored by Marketing Type Guys. EXTREME GAME TRUCK: The game truck will be available from 12:00pm-4:00pm. Tickets are $5 for 30 minutes or $20 for an unlimited pass. (Due to popularity there will be a rotation set up to allow everyone a turn.) The EXTREME GAME TRUCK is sponsored by People's Mortgage. FREE FAMILY MOVIE: Stage Door Theatre is hosting the FREE family movie, Disney's Finding Dori. The movie begins at 1:30pm. Popcorn and refreshments will be available for a small donation. If there is not snow are they going to try and come up with some other events? HappyCamper wrote: If there is not snow are they going to try and come up with some other events? Yes! 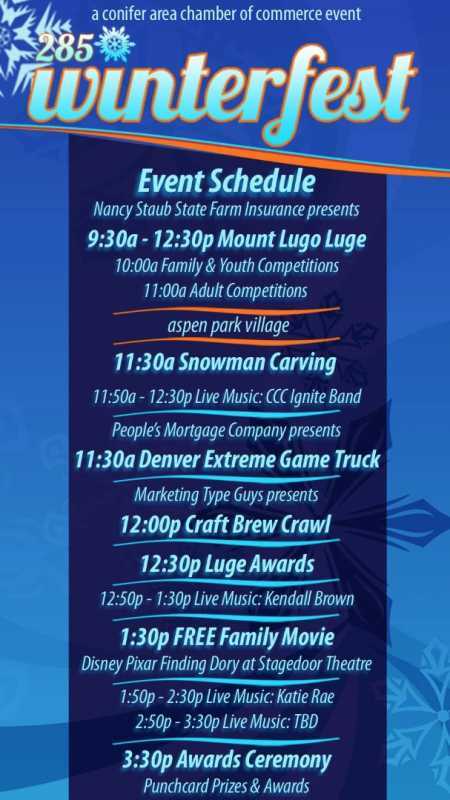 Regardless of the snow conditions, the activities over at Aspen Park Village - the snowman carving competition, Craft Beer Crawl, Extreme Game Truck, and Free Family Movie at Stagedoor will be happening! The snow is starting to pile up on our sledding hill! 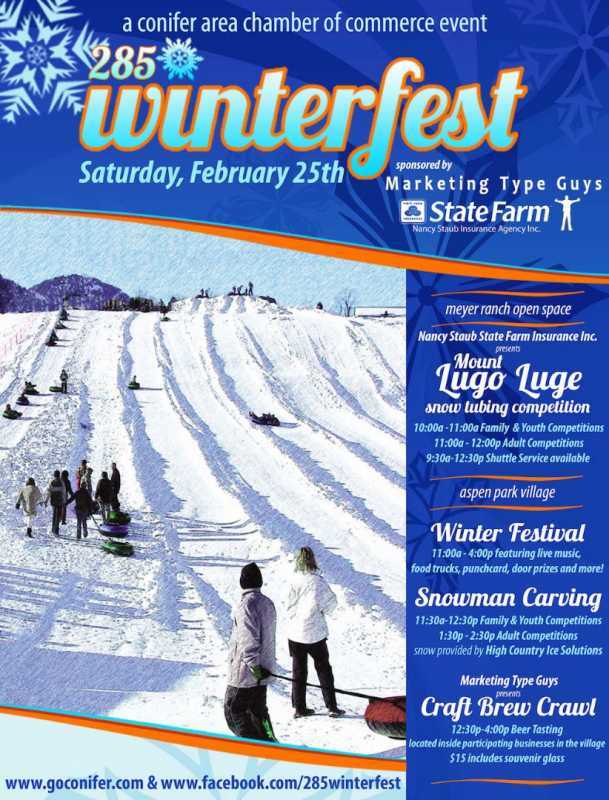 Register for the Mt Lugo Luge family or team competitions at www.goconifer.com/285-winterfest and don't forget to fill out any local schools any of your teammates attend for the $100 prize for the most school participants. 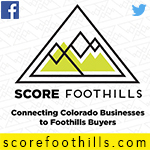 Help us select Conifer's favorite Craft Brew Saturday at the second annual Craft Brew Crawl sponsored by Marketing Type Guys at Aspen Park Center from 12p - 4p. We are super pumped to offer 8 local breweries and one kombucha option. The Craft Brew voted Conifer's Favorite will receive this classy plaque AND will be listed on our tasting glasses for the 2018 285 Winterfest. THANK YOU to our breweries for their support! SNOWMAN CARVING starts at 11:30a at Aspen Park Village. Registrants should be there no later than 11:30a. ONLY ONE SPACE LEFT!! !